There are many obvious ways to waste one’s time, and there are the less obvious ones. Let’s talk about the latter. One of the first thing I notice when pairing with co-workers and friends is whether or not they have what is often described as “option as meta key” enabled in their Shell app. Even in a basic text editor like OS X’s TextEdit, whenver you type words separated by spaces, you can easily jump to the beginning of each word by using the Option key alongside with either the Left or Right arrow keys. Nothing amazing, maybe you think this is neat. Well, inside of a Shell, you often can’t use your mouse to place your cursor wherever you wish. This seems backwards (because it is) but it’s a remnant of a world where the mouse didn’t exist. Regardless, many developers eschew the mouse altogether for the sake of keyboard efficiency. Yet it seems like few developers realize that this fast jumping between words is also possible in their Shell. On OS X, in the default Terminal app, when you open Preferences (please use Command + , to do that in any OS X app worth its salt) and go to the Settings tab, under Keyboard you will find a checkbox named Use option as meta key. Enabling this option will let you fly between words with your arrow keys when holding Option. And if you’re one of those fancy cats using iTerm, the process is a bit more involved. 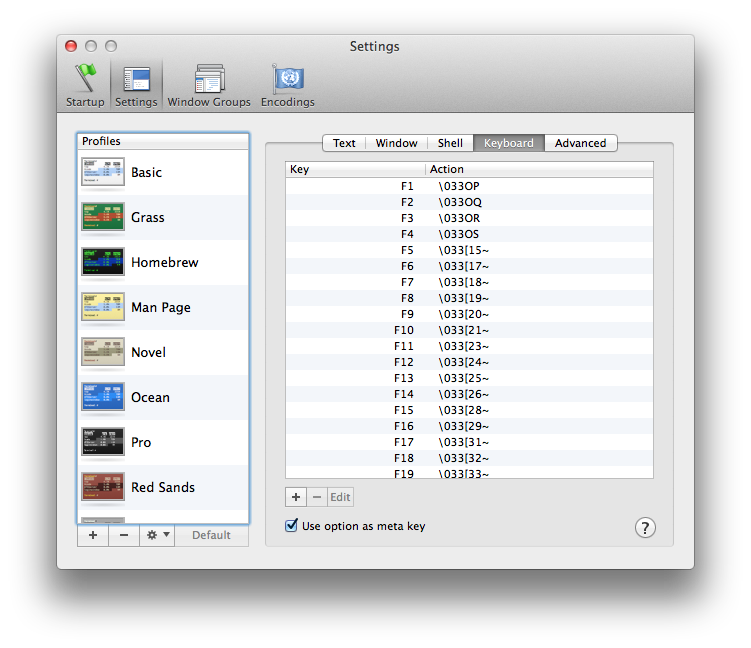 Go to Preferences (you better be using Command + , this time), under the Keys tab. In there you’ll see a list of Global Shortcut Keys. You’ll need to add the following two global shortcuts. Hold the Option and Left Arrow keys in the Keyboard Shortcut input field, then select the Send Escape Sequence Action, and finally set the Esc+ field to B (for back). Hold the Option and Right Arrow keys in the Keyboard Shortcut input field, then select the Send Escape Sequence Action, and finally set the Esc+ field to F (for forward). You’ll see a warning whenever you save those shortcuts. I believe it’s okay to ignore these unless you already use a keyboard shortcut profile that has the same combinations of keys. In this situation you will have to delete your Profile-specific shortcuts otherwise they will override the global ones presented below, otherwise this won’t work as expected. This optimization is an example of something you can apply to your life every single day. What task or step of a task are you repeating over and over again. Have you tried to find a better, faster way to do it? It it seems too difficult? What about working with someone by your side (pairing) and asking them if they have a solution, perhaps? Every single time I pair with someone on our team at Code School I learn something new like this. What I like even more is that these tricks don’t always correlate with experience. Many people with experience settle for inefficient workflows because they’ve become comfortable with them. Sometimes, that’s fine. Changing a workflow that works can be a distraction. More often though, you can chip away at the little frustrations of your day and hone your tools little by little, until you master them. PS: If this topic interests you I highly recommend listening the Sharpening Tools episode of the Ruby Rogues podcast with Ben Orenstein. His daily ritual to find something inefficient from the days or weeks before and search for a way to optimize it is an excellent idea.